Win­ston Churchill was no saint; it is a dis­ser­vice to pre­tend he was. But he is too com­plex to be pigeon­holed by writ­ers who crit­i­cize selec­tive­ly. Hills­dale College’s Churchill Project responds to the mythol­o­gy. Read full arti­cle. Win­ston Churchill is in the news, as is often the case. On Feb­ru­ary 11th, Pres­i­den­tial can­di­date Bernie Sanders had words of praise for Churchill’s war lead­er­ship. Vox Media has crit­i­cized him and Churchill in sharp lan­guage. 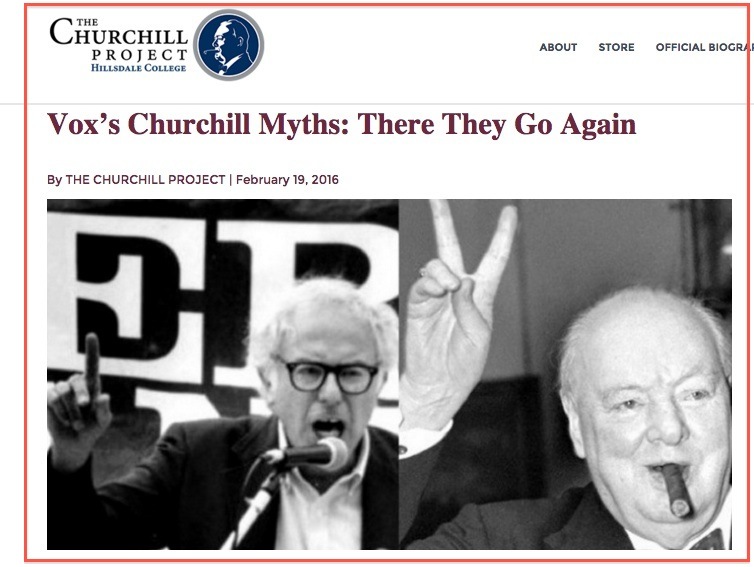 Are the crit­i­cisms of Churchill true? Thanks for the amus­ing “Oba­ma, Cal­houn and the Churchill Bust-Out.” What do you say how­ev­er about the Dai­ly Telegraph’s spec­u­la­tion that Obama’s rejec­tion of Churchill was based on the British jail­ing and tor­ture of his grand­fa­ther, Hus­sein Onyan­go Oba­ma, between 1949 and 1951, “dur­ing the Mau Mau rebel­lion in Kenya”? —R.P.